Short article and interview with Albert. Spending his days welding and grinding metal, sculptor Albert Dicruttalo can’t imagine a better place to be an artist than Oakland. Working out of fellow artist Bruce Beasley’s warehouse on Lewis Street in West Oakland, Dicruttalo has been creating things since childhood. While he has experimented with various media, he learned to weld at age 17 and was hooked on becoming a metal sculptor, drawn to the medium for its strength, toughness, and beauty. With titles like Looper and Whiz Bang, many of his sculptures emit a circular flow of infinity, while others, like Epoch, Dwell, and Truce stand solidly grounded in conviction, as their names imply. Dicruttalo grew up in the Adirondack foothills in upstate New York, in the glove manufacturing town of Gloversville, and received a BFA from Ithaca College in 1989. He worked for two years in the program of computer graphics at Cornell University where he explored how to use electronic technologies for creating sculpture. He moved to Oakland in 1996 to apprentice with Beasley, established a studio and foundry, and settled into a new life in the Bay Area. The space where he works now at Beasley’s warehouse boasts a 5,000 square-foot-studio, a sculpture garden, a 2-ton bridge crane, and two Rottweilers. Working mostly in stainless steel, Dicruttalo designs pieces using a robust application called Rhino CAD, or computer aided design. “It allows me to ‘draw’ in 3-D and alter compositions without fear of losing something I like. Then I generate precise plans for cutting and forming patterns,” Dicruttalo said. He contracts with Nor Cal Metal Fabricators in West Oakland to water-jet cut and form parts for his sculptures, then fabricates all the parts in his studio, generally working alone. His work, which he describes as purely formal and meticulously crafted, is intended to be autonomous. “I care deeply about how the sculpture feels, hoping the forms are compelling and have some emotional punch,” he said. Dicruttalo is mostly influenced by the Modernist Movement of the early to mid-20th century, not just art, but design and architecture as well. 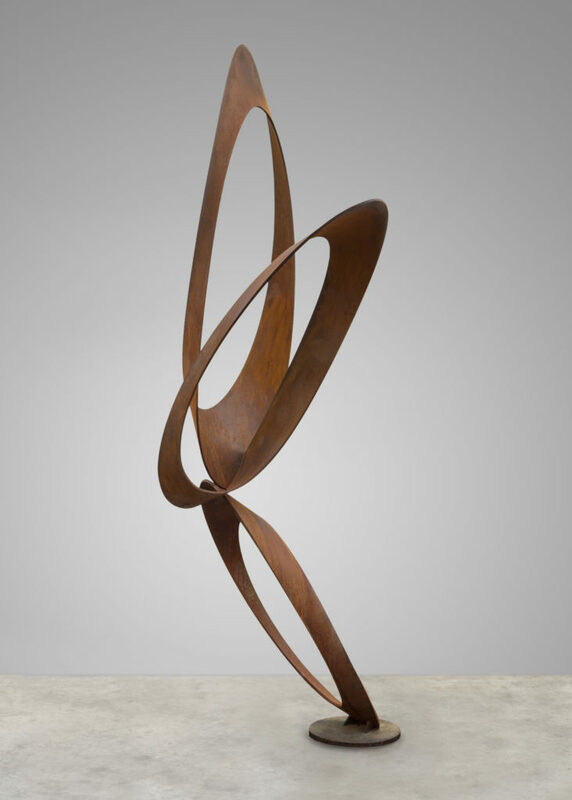 His creative influences are the artists he refers to as “The Gods of Modernism”: Brancusi, Arp, and Noguchi, though he also admires numerous contemporary artists. “The rich tradition of Bay Area sculptors has informed my work, including Ruth Asawa, Stephen De Staebler, Joe Slusky, Nathan Oliveira, and William Wareham,” he said. “And of course, Bruce Beasley, who has become a close friend, colleague, and mentor.” Dicruttalo is married to Jane Greenberg (a documentary filmmaker who has been featured on PBS), has two children, and a dog. He is also an avid skier, guitarist, a novice fly fisherman, and likes to sing at The Alley piano bar in the Grand Lake district in Oakland. He has numerous exhibitions across the country under his belt, including museum showings, has public art installations around California, and has taught at the Academy of Art in San Francisco. Dicruttalo has been represented by Andrea Schwartz Gallery since 2013, where his most recent show closed in December. He just completed a public art sculpture for a residential complex in Livermore. For more information, visit his website at AlbertDicruttalo.com. Group show at Bardessono in Yountville, California. View a complete list of Albert's previous exhibitions on his Bio c/v page.